In the emotionally-charged, fire-filled faith in which Addie Zierman grew up, the answer to this question was simple: Because you’ve FELT him. Now, at age 30, she feels nothing. Just the darkness pressing in. Just the winter cold. Just a buzzing silence where God’s voice used to be. So she loads her two small children into the minivan one February afternoon and heads south in one last-ditch effort to find the Light. 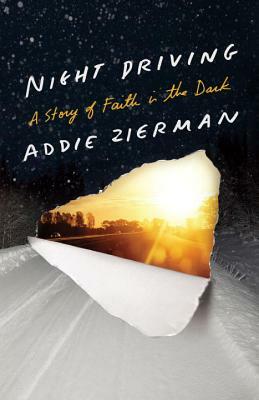 In her second memoir, Night Driving, Addie Zierman powerfully explores the gap between our sunny, faith fictions and a God who often seems hidden and silent. Against the backdrop of rushing Interstates, strangers’ hospitality, gas station coffee, and screaming children, Addie stumbles toward a faith that makes room for doubt, disappointment, and darkness…and learns that sometimes you have to run away to find your way home. "Addie Zierman is earnest and likable. She invites you into her story in order to better understand your own." Addie Zierman is a magical storyteller, a writer whose prose is rich and wise and full of good thoughts that stay with you. Like Elizabeth Gilbert or Barbara Brown Taylor, in Night Driving: A Story of Faith in the Dark Zierman uses the power of her story to beautifully navigate familiar themes like faith, emotions, emptiness, and fear.